If it is almost instant gratification you need, this dish is ideal: once the pasta is cooked and ready, it’s really a matter of minutes before you have something immensely satisfying. If brandy isn’t something you keep in stock, you could try with whisky, but a dry white wine would do the trick. When it comes to the peppercorns, please try and stick to the recipe as best you can: green peppercorns are black peppercorns that haven’t been through the drying and maturing process, but their flavour is more vegetal than warming. I use dried here, which are slightly weaker. If you can’t find the green ones, 2 teaspoons of coarsely ground black pepper would be a reasonable alternative, but, please, never ever use pink peppercorns for this – unless you want a mouth so numb that you feel you’ve visited a backstreet dentist. This is my version of the classic cherry and almond cake. 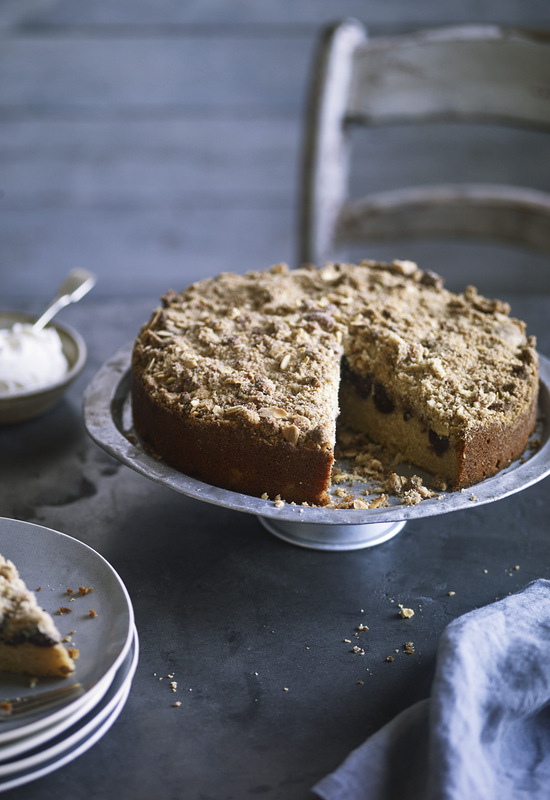 The crumble topping adds another almond dimension in the form of crunchy amaretti and flaked nuts. This is best served with a dollop of tangy crème fraîche. Preheat the oven to 180°C/160°C fan/gas mark 4. Grease a 23cm round, loose-bottom cake tin, and line the base with baking paper. Bake the cake in the preheated oven for 35–40 minutes, or until a skewer inserted comes out clean (apart from the red juice of the cherries). Leave to cool completely, then transfer from the tin to a cake stand or plate to serve. 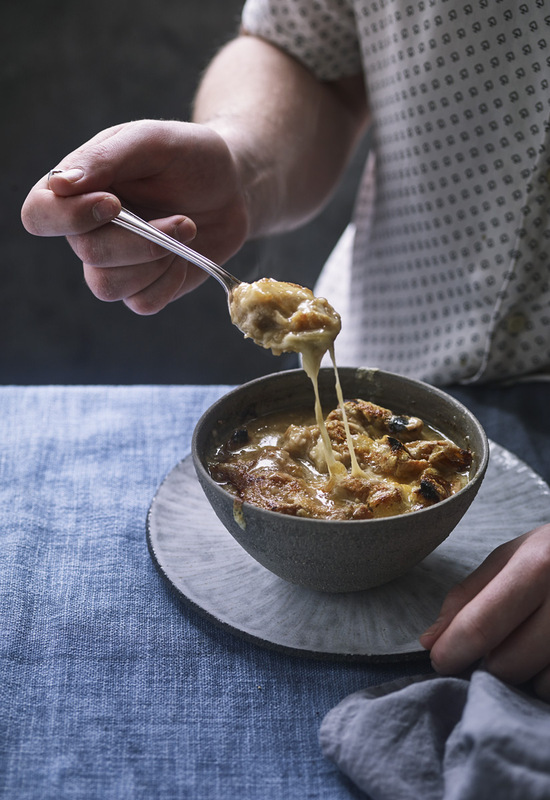 There are many different ways of making a French onion soup: some recipes involve wine, some cognac, while others use both. I’m supposing that most regions of France, if not most families, will have their own method and ingredients list. Epoisses is a cheese from Burgundy and I haven’t seen it used for the characteristically lavish crust, but for me it’s a no-brainer: the cheese is soft and pungent, accompanying the sweet onions perfectly. Here I’ve rounded out the Epoisses with some Comté. Caraway is something I eat regularly with Epoisses – if not caraway bread then I just scatter the seeds over spoonfuls of the cheese. I find the sweetness of pink onions – Roscoff or Rosanna – makes for the best soup, but if they prove a little trickier to come by, just use half red and half brown. For the croutons, place the torn baguette onto a baking sheet and toss together with the oil and caraway seeds. Bake for 5–10 minutes, or until dry and crispy. For the soup, heat the oil and butter in a large saucepan or casserole over a high heat. When the butter melts, add the onions and cook for 10 minutes or so, until they are starting to colour around the edges. Once they are gently browned, reduce the heat to low and cook slowly for anything up to 40 minutes. The onions should caramelise deeply, and smell strong and sweet. When the onions are caramelised, add the flour and stir to coat the onions. Increase the heat to high, wait a minute for the pan to get hot, then pour in the wine and let it bubble and evaporate almost entirely. Add the stock and bring to the boil, then reduce to a simmer and cook for 45 minutes, partially covered. Stir in the chutney, if using, and salt and pepper to taste. Divide the soup between serving bowls – make sure they’re heatproof – then scatter over the croutons. Slice the Epoisses into fairly thin slices (do so quickly before it starts to melt) and lay them on top of the croutons. Scatter over the Comté, and grill until the cheese has melted and burned a little at the edges. I can’t remember where the inspiration for this recipe came from. I think it was Diana Henry, who, as far as I can recall, posted an Instagram picture from Iceland with a lamb leg cooked in rhubarb jam. Wherever the idea started, I’m sincerely grateful. The mixture of rhubarb and ginger is both tart and warming, which, when married with the earthy beetroot and starchy potato, is just fab. Preheat the oven to 220°C/200C fan/gas mark 7. Put the potatoes, beetroot and bay leaves into a large roasting dish and toss with the oil and a generous pinch of salt and pepper. Roast for 30 minutes. Meanwhile rub the lamb chops with the jam, covering the chops completely. After the vegetables have roasted for 30 minutes, place the lamb chops on top and roast for a further 20 minutes. Remove the dish from the oven, cover it loosely and allow the meat to rest (still on top of everything is fine), for 5 minutes before serving. These aren’t at all dissimilar to the Spanish doughnut treat, churros. In fact, they’re pretty much the same thing, only shaped in rings rather than fat, spikey sausages. The pastry itself is just a choux pastry, which isn’t at all difficult; although it mistakenly has the reputation of being tricky to make. It isn’t. To amp up the flavour I use a dry cider in place of water, which gives the pastry that apple undertone. For the choux pastry put the water, salt and butter into a small saucepan and set over a low heat just until the butter melts, then increase the heat to high. Once the water starts to boil, remove from the heat and quickly stir in the flour – you must do this vigorously and quickly to form a very thick, smooth dough. Put the pan back on the heat, stirring to dry out and smooth the dough – about a minute. Put the dough into a mixer fitted with paddle attachment. Beat the eggs in a bowl and add, a drop at a time, to the cooled dough, beating very well after each addition until each addition of egg is completely incorporated. You may not need all of the egg; once the mixture is smooth and falls reluctantly from the spatula to form a V-shape, it’s ready. Put the choux into the piping bag fitted with a large star nozzle. Pipe the pastry into 7cm diameter rings on the squares of baking paper. Preheat the fryer to 175°C. Place the pieces of baking paper, cruller-side-down, into the oil, then remove the baking paper with kitchen tongs. Fry for a minute or two per side until golden brown and crispy. Remove with a slotted spoon and set onto kitchen paper to blot off the excess oil. For the icing, sift the icing sugar then whisk in enough cider to make a thick icing. 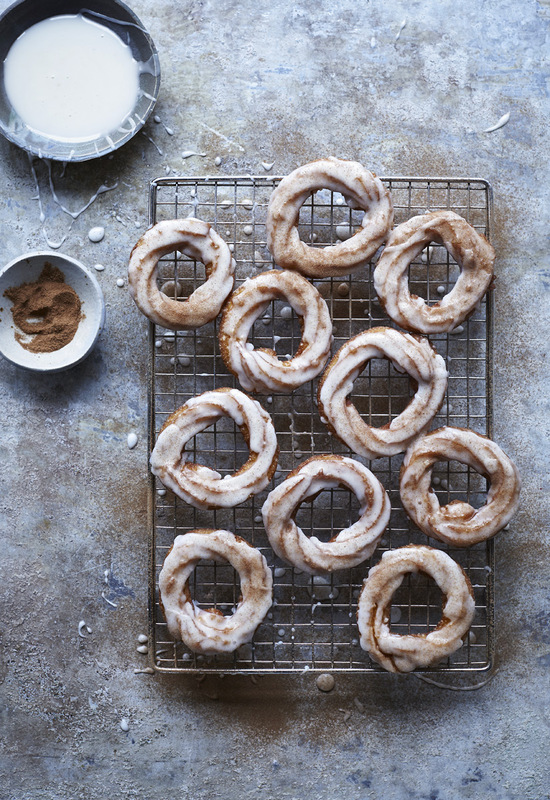 Dip the crullers into the icing, and then dust with cinnamon and serve. I suppose the title here is all wrong. 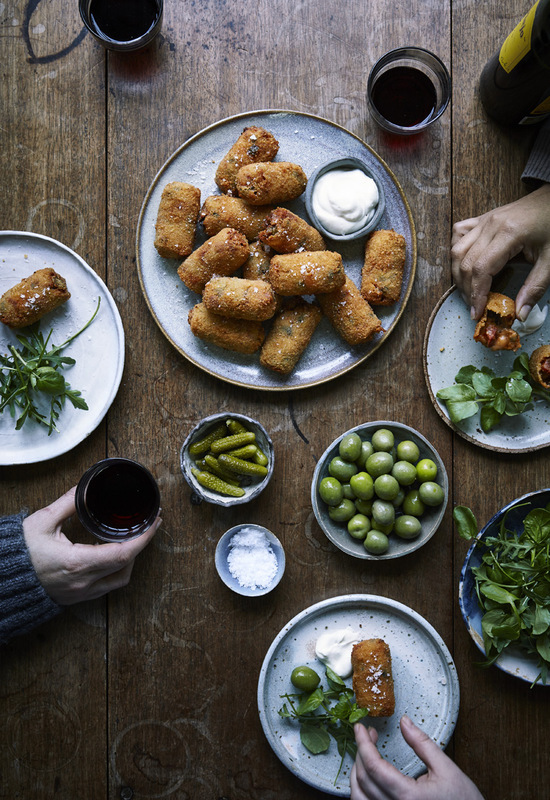 Being flavoured with the piquant nip of chorizo and manchego, I’m guessing they should take their Spanish name: croquetas. But I can’t part with the school-dinner version. I remember the yelps of joy as we entered the dinner hall to see ‘potato croquettes’ scribbled hurriedly onto the blackboard; the bright orange cylinders of spud were adored by all. In my heart these will always be croquettes. Start by making the sauce. Heat the butter in a medium saucepan over a medium-high heat until the butter melts, then stir in the flour using a wooden spoon to make a very thick paste. Allow the paste to cook for a minute until browned slightly. Slowly add the milk, beating constantly – I switch to a whisk when half of the milk is incorporated to ensure there are no lumps. This will be very thick, like porridge without the oats. Reduce the heat to low and cook stirring for a minute or so, to ensure the starchy taste of the flour is cooked off. Remove the pan from the heat and stir in the tomato purée, mustard, cheese, cream, chorizo, beans and jalapenos. Pour the mixture onto a plate, cover with clingfilm, and refrigerate for at least 3 hours until very stiff – if you have the time and patience, overnight is better. To assemble, prepare a little production line: put the flour onto a plate, beat the eggs into a bowl, and put the breadcrumbs onto another plate. Scoop tablespoonfuls of the chilled filling and shape into chunky pellets – I dip my hands in a little flour to stop the croquettes sticking and roll them into short, fat cylinders. Dust the croquettes in flour, dip them in the egg, then coat them in breadcrumbs. Place the coated croquettes on a plate or tray ready for frying. Heat 2cm of oil in a large sauté pan or casserole and allow it to get hot. Fry the croquettes for a minute or so per side until bronzed and crispy – don’t overcrowd the pan or the croquettes will never become golden enough; fry in batches. Transfer the fried croquettes onto a plate lined with kitchen paper to blot off any excess oil, and serve. Although the method above works fine, I do prefer to deep-fry the croquettes to retain their shape. Heat a deep-fat fryer to 170°C. Once hot, add the croquettes, in batches, fry until golden then blot on kitchen paper to remove excess oil before serving. The croquettes can be made completely and frozen before cooking. Place them, well spaced, on a baking sheet and freeze. Once solid, put into an airtight container or freezer bag and store in the freezer for up to three months. The croquettes can be deep-fried from frozen, but will take a little longer at a slightly lower temperature. Dhal is a doubly comforting dish: it has that reassuring sloppiness of mushy peas or mashed potatoes, yet still packs a fulfilling punch with its slightly muted spiciness. 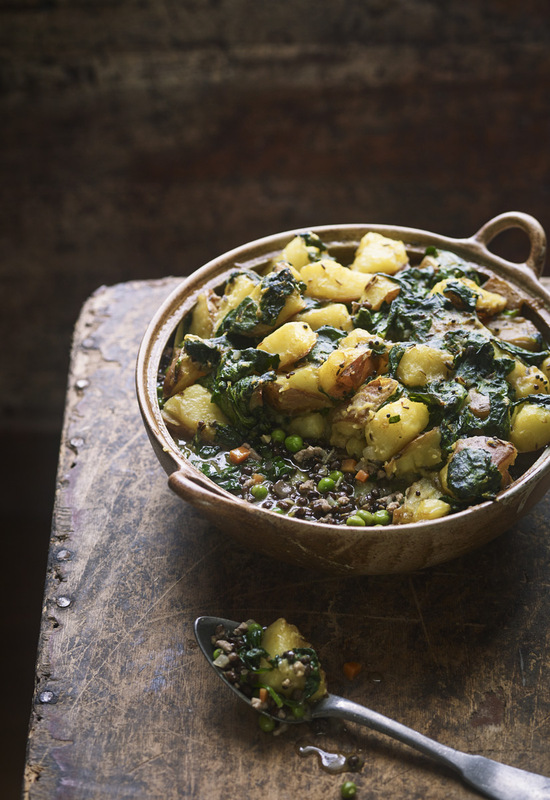 That flavour is thanks to the tarka – a blend of spices is cooked separately in oil then added to the cooked lentils. If you can get fresh curry leaves for this recipe, it will be so much better. They’re stronger and impart their unique flavour – for me their flavour is more of a feeling: something in between a pop and a click in the mouth. Put the lentils into a sieve and run under cold water until the water draining from the lentils runs clear. Add the lentils to a pan with the turmeric and stock (or water) and bring to the boil. Once the liquid is boiling, reduce the heat to a brisk simmer, and cook for about 30 minutes, until the lentils are very tender. Turn off the heat and leave the lentils for a good 15 minutes to plump up even more. For the tarka, put the coconut oil into a frying pan over a high heat. As soon the oil shimmers add the mustard, cumin and nigella seeds, along with the bay leaf and curry leaves. Fry for a few minutes, until the spices smell strongly aromatic and the mustard seeds stop popping (it's wise to cover the pan with a lid as they pop), then add the chillies and onion. Reduce the heat to medium and fry, stirring frequently, until the onion is soft and just lightly golden – about 15 minutes. Add the garlic, ginger and tomato and increase the heat to medium-high. Cook until the tomato breaks down and, once the oil has risen to the surface, the tarka is ready. Break the lentils down – I use a potato masher – then add the tarka. Return to the heat to warm through, season to taste, and serve with the chopped coriander and the bread. If you've enjoyed this recipe, then you'll love the book it's taken from. Comfort: Food to soothe the soul is available to purchase here.